A new exhibit at the U.S. Botanic Garden in Washington features a vibrant collection of orchids from all over the world. This elegant flower is not solely ornamental, its uses also extend to medicine and cooking. To walk into the U.S. Botanic Garden in Washington is to encounter a feast for the senses. Johann Strauss’s classic Blue Danube waltz fills the air as does the sweet aroma of hundreds of fragrant orchids. This sensory orchestra is part of a new exhibit fittingly called “Orchid Symphony,” an annual collaboration with Smithsonian Gardens. In keeping with the musical theme, there are also topiaries in the shape of a violin, a cello and other musical instruments “to add a bit of whimsy to the garden,” he said. Nelson added that while the garden has a permanent orchid room within the conservatory, this time of year they have thousands of orchids coming into bloom, which provides a great opportunity to get the message of orchids across to the public. Orchids are found in almost every eco-system in the world. 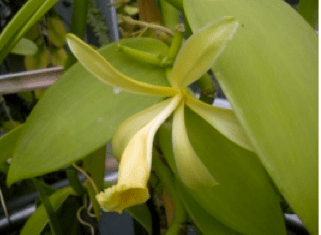 Jungle orchids thrive in various tropical climates and there are desert orchids blooming in arid environments, according to the garden’s deputy executive director Ari Novy. He pointed to a flower that he identified as a Mexipedium orchid. Just like a cactus or any other desert-adapted plant, this orchid can store moisture so that it can handle the long periods of drought in the arid environment. Novy also pointed to a batch of lovely purple flowers with elongated green leaves called Bletilla Striata, or the Chinese Ground Orchid. In addition to using orchids for medicinal purposes, many cultures eat them in food products, often unknowingly. Madagascar is the largest producer of vanilla beans, but since the island lacks the plant’s pollinating bee species, the flowers must be hand-pollinated. Orchids, as with roses, are often created to honor someone famous. A large painting of a Cattleya ‘Michelle Obama’ orchid, by orchid artist Patricia Laspino, is on display in the entry foyer of the Garden. It is the latest in a line of First Lady orchids that began in 1929 with the pink bloom named for Lou Henry Hoover, wife of Herbert Hoover. Carbon Tax: Will You Fiddle While Paris Burns? It’s Real Property Because We Said So!